Six convoys of semi-automated "smart" trucks arrived in Rotterdam's harbour Wednesday after an experiment its organisers say will revolutionise future road transport on Europe's busy highways. More than a dozen self-driving trucks made by six of Europe's largest manufacturers arrived in the port in so-called "truck platoons" around midday, said Eric Jonnaert, president of the umbrella body representing DAF, Daimler, IVECO, MAN, Scania and Volvo. "Truck platooning", similar to concepts with self-driving cars, involves two or three trucks that autonomously drive in convoy and are connected via wireless with the leading truck determining route and speed. 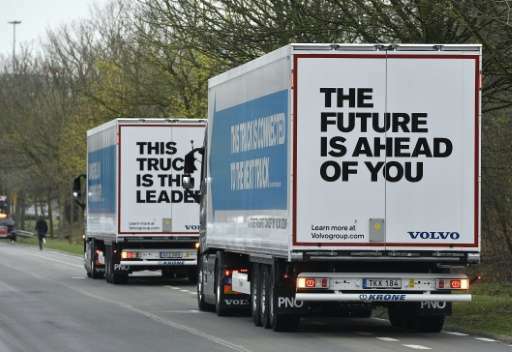 Wednesday's arrival concludes the first-ever cross-border experiment of its kind with self-driving trucks which left home factories from as far away as Sweden and southern Germany, Jonnaert told AFP. "Truck platooning will ensure cleaner and more efficient transport. Self-driving vehicles also contribute to road safety because most accidents are caused by human failure," said Dutch Minister Melanie Schultz van Haegen. For instance, because the trucks are connected via wireless they brake at the same time to always maintain the same distances between them, added the Dutch infrastructure and environment ministry. "The advantage of truck platooning is that you have trucks driving at a consistent speed," said Jonnaert, saying the concept will greatly aid traffic flow on Europe's heavily congested roads. The trucks used in Wednesday's test however are still semi-automated and despite computers allowing them to drive by themselves, human drivers were still required on board. The proponents of truck platooning say several hurdles still need to be ironed out and road users will not see self-driving trucks just yet. Difficulties include standardising regulations across the continent to enable self-driving convoys and designing systems that will enable communication between different trucks from different manufacturers, Jonnaert said. "This is all part of a journey, which we are on as the automotive industry, towards highly-automated vehicles," said Jonnaert. The Netherlands, which currently holds the revolving EU presidency, will hold an informal summit mid-April to discuss changes to regulations needed to "make self-driving transport a reality," Dutch officials said. For anything & everything we need to litter this planet with CCTV Cameras. They go a long way in aiding in improvement of Human Life.....IN SEVERAL INNUMERABLE RESPECTS! Sit & Start to Imagine The Various Ways that will become Possible!